Just a quick email to show how the best laid plans can sometimes be undone. It began with a very sore jaw (Nigel), which became progressively more painful until a trip to the hospital in Bourke was required (2 hours round trip, 5 minute consultation). 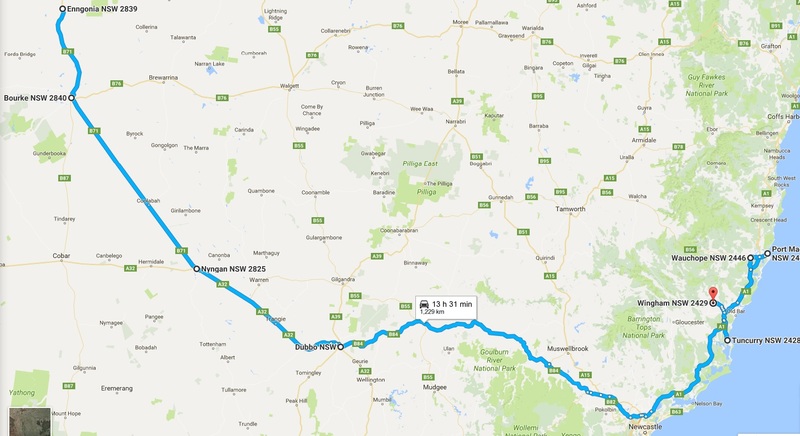 After advice from the doctor that it might be an abscess, a trip to the dentist in Nyngan was organised (6 hours round trip, 5 minutes consultation). When it was revealed that the Nyngan surgery doesn’t actually have an X-ray machine, an appointment was organised for a dental X-ray in Dubbo (10 hours round trip, 5 minute X-ray) to see whether it was indeed an abscess or a possible jaw fracture. So last Thursday we turned the trip into somewhat of an ‘outing’ because as everyone is no doubt aware, trips to the dentist are much more fun when you take the wife and dog with you and maybe even stay the night. The trip itself was fairly unremarkable until a radio news item announced that the Bentley coal seam gas protest (outside Lismore) had been called off because Metgasco’s licence had been cancelled and they were due to appear before ICAC. This was of particular interest because Nigel was due to be part of the 800-strong police operation to ‘keep the peace’ during Phase 2 of “Operation Stapler” (Who chooses these names?) from the 24th to the 31st of May. While Nigel was away I had come up with a much more exciting plan to head over to Paradise with the Bear for that same week. In my excitement, I had also bought quite a few online (Gumtree and Ebay) items, which I would pick up (from Port Macquarie, Wauchope, Wingham and Tuncurry) while I was there. Now that Nigel was no longer required, and with only one car between us, I would have to cancel the trip and contact the sellers to ask if I could postpone pick up. Enter Plan B. With a certain air of spontaneity, it was rather rashly decided that we’d get the X-ray over and done with and then continue on our merry way to Paradise because serendipity had arranged that Nigel had the next three days off. We arrived (very tired) on Thursday night and spent most of Friday and Saturday driving up and down the mid north coast collecting purchases (not quite the leisurely pace I had envisaged). Then on Sunday morning we took off bright and early for the return trip. We slid the X-ray under the door of the dental surgery on our way through Nyngan and rang for the results on Monday morning, only to find out that the dentist had taken off for a week’s holiday. So we’re still waiting to find out what caused the pain in Nigel’s jaw but thankfully, and after 3 weeks of antibiotics, that pain has now subsided. There was a time when those sorts of distances wouldn’t even be contemplated in such a short time span so I guess we’re becoming a little bit ‘country’. Of course, after the initial glee and excitement of the decision came: What about clothes? What about keys? What about food? What if we have tenants staying? etc but in the end everything was fine and our whirlwind adventure was actually a lot of fun. So apologies to friends and neighbours, who must be wondering whether they actually saw our car or not. PS a phone call from Police admin this morning advised that our residence is “scheduled for demolition”… reminds me of Ford Prefect in Hitchhiker’s Guide to the Galaxy… but luckily/hopefully we’ll have a say on when and where we move to. Will keep you posted. Previous Previous post: The eagle has landed!